Amatrol’s Alternators / Synchronous Motors Learning System (85-MT2C) adds to Basic Electrical Machines Learning (85-MT2) to teach alternators and synchronous motors commonly found in industrial applications. Alternators provide a mobile source of AC electrical power while synchronous motors reduce power costs by correcting the overall power factor in a plant. Learners study industry-relevant skills including how to operate, install, and analyze the performance of alternators and synchronous motors. The alternators and synchronous motors training system includes capacitive load, combination synchronous motor/ alternator, and synchronizing lights / switch unit. The capacitive load unit combines with the industrial motor training system (85-MT2) to provide operation under various types of loads. In addition to industrial components, this training system includes in-depth curriculum, instructor’s guide, and student reference guide. The curriculum covers major topical areas such as alternator output voltage and frequency, three dark synchronization method, and reversing a synchronous motor. This system also offers curriculum in an optional, highly interactive multimedia format. 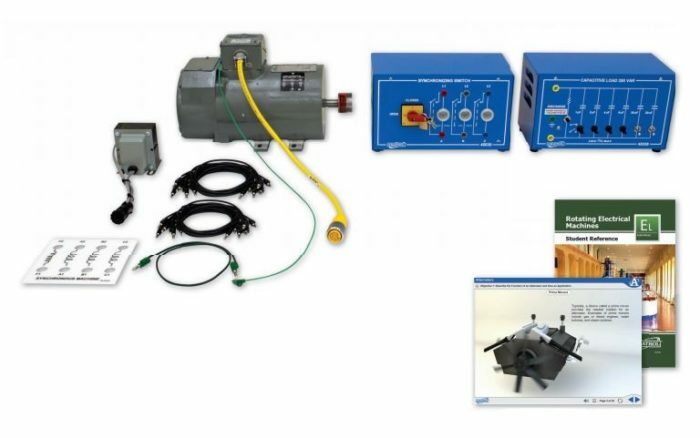 The alternators / synchronous motors training system provides a variety of industrial components for skill-building, including a capacitive load unit, a synchronizing switch and light unit, and a 1/3 Hp alternator / synchronous motor. Learners will use these components to build hands-on electric machine skills, such as connecting and operating a rotating armature type alternator, controlling the frequency of an alternator, synchronizing an alternator to the line using three dark method, connecting and operating a synchronous motor, and operating a synchronous motor with lagging, unity, and leading power factor. This industrial motors training system offers Amatrol’s in-depth curriculum that covers all of the topics that learners need to grasp theoretical concepts about alternators and synchronous motors. As an example of what’s covered, learners will study how single-phase power is produced, how to synchronize alternators using two bright, one dark method, and how the DC field excitation level affects synchronous motor operation. This learning system’s curriculum is presented in a multimedia format that features video, audio voiceovers, 3D animations, and interactive quizzes and activities. The alternators and synchronous motors training system is just one option for electrical machine training from Amatrol. Other options to add onto the Basic Electrical Machines (85-MT2) include DC Generators (85-MT2B) and Wound Rotor Motor (85-MT2D). The DC generators training includes a restrictive load unit and an inductive load unit to cover topics like performance measurement, performance analysis, and DC series, shunt, and compound generators. The wound rotor motor training includes a wound rotor controller and motor to cover topics such as speed controllers, motor reversing, and performance analysis and measurement.